Benjamin Alvin Drew, Jr. remembers well his flight as a NASA astronaut aboard Space Shuttle Discovery. This mission to the International Space Station (ISS), which took place from February 24 to March 9, 2011, would be NASA’s final Shuttle flight before the trailblazing Shuttle program was discontinued. On this flight Alvin took part in two spacewalks while docked at the ISS, and as a result he became the 200th person to walk in space. This also made him one of the last U.S. astronauts to walk in space (and the final African American to fly aboard a Space Shuttle) before the Shuttle program ended. A now-retired colonel from the U.S. Air Force where he served as a combat pilot, he also distinguished himself aboard Discovery’s final mission by beginning a new reading program for kids called “Story Time in Space” which he hopes will be continued by other astronauts aboard the International Space Station. For his first reading in the program during the flight (which he performed for kids via satellite), he selected the popular children’s book, “Max Goes to the Moon”, written by Jeffrey Bennett. 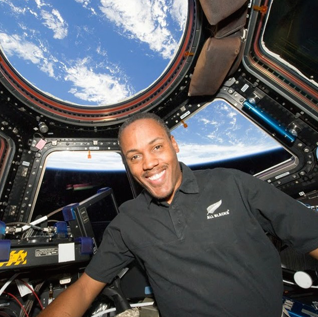 “The flight was a good time to think big thoughts, and I also wanted to include something we could build upon to keep the wonder of space exploration alive for children” says Alvin, who was selected by NASA as an astronaut in 2000. He would go on to log more than 612 hours in space aboard the Shuttles Endeavor and Discovery. Born in Washington, D.C., he recalls having a desire to be a pilot from as early as four years old. In 1968, at the age of five, Alvin saw the Apollo 7 launch on television, and thereafter dreamed of becoming an astronaut. After completing high school in Washington, DC, Alvin went on to earn a dual Bachelor’s of Science degree in physics and astronautical engineering from the United States Air Force Academy in 1984, and a Master’s degree in aerospace science from Embry-Riddle Aeronautical University. He then earned a Master’s degree in political science from the Air War College. He was commissioned a Second Lieutenant from the United States Air Force Academy in 1984 and went on to complete his Undergraduate Helicopter Pilot Training at Fort Rucker, Alabama, in 1985. His initial assignment was as a helicopter pilot flying combat rescue missions. He later flew more than 60 combat missions over Panama, the Persian Gulf and northern Iraq. He completed USAF Fixed-Wing Qualification in 1993, and the United States Naval Test Pilot School in June 1994. He has commanded two flight test units and served on Air Combat Command staff. Alvin is a Command Pilot with over 3,000 hours flying time, and has flown in over 30 types of aircraft. He retired from the Air Force in 2010, after more than 25 years of service. In his current role at NASA, Alvin serves as the NASA Liaison to the Department of Defense, where he brokers and oversees agreements and partnerships between NASA and the Department of Defense on virtually all matters of overlapping interest between the two agencies.